My college classmate and teacher friend, the extraordinary Ken Templeton, wrote a beautiful recap of the Lone Bellow/Aoife O’Donovan show we saw together back in November. He caught the concert writing bug, so here’s what Ken had to say about the Lyle Lovett/John Hiatt show he saw last month at the State Theatre in Portland. I didn’t make it out for the show, so consider this the first official post on whatbreedidntsee.com! Thanks, Ken! Wow. As the steady bass line of “Walk on the Wild Side” rolled through Merrill Auditorium, the crowd in Portland left the Lyle Lovett/John Hiatt concert grinning. To a person, grinning. I don’t think it was just that the music was great or that they played literally every single song requested from shouts by audience members. Their performance was humble and sincere and, moreover, it really did feel like they wanted you there with them. Now, if that was an act, it was pretty convincing. I am choosing, in my elated state, to believe that these two giant musicians really did want me there. The two of them are so different, but they complement each other so well. Hiatt is often gritty, his raspy voice echoing the sentiment of his songs while Lyle’s unique, smooth vocals often belie the sentiment of his own. A good example about that sleight of hand: after Hiatt played “Tennessee Plates,” and a little banter about stealing cars, Lyle played “L.A. County,” an uptempo, really fun song about driving for miles to kill the woman you love and the man she’s marrying. The chorus for that song is that: “And the lights of L.A. County / Look like diamonds in the sky / When you’re driving through the hours / With an old friend at your side.” The old friend is a Colt 45. One of the highlights for me was hearing Lyle and John talk about Sonny Terry and Brownie McGhee, two giants of blues music in the 1960s and 1970s. Lyle talked about being told to buy their album and immediately being drawn to the song “White Boy Lost in the Blues,” which he finally recorded on his last album. Lyle mentioned that Michael Franks wrote the song. (He also wrote “You Bring Out the Boogie in Me,” also on that album Sonny & Brownie, with a stride piano rhythm that you cannot help but dance to.) As an aside from the concert, that album, Sonny and Brownie, is absolutely spectacular. Their version, with John Mayall, the British blues musician who must have been in awe to play with two of his heroes. It’s a really funny song about authenticity: “You bought your six-string Gibson. / You bought a great big amp. / You try to sing like Muddy Waters / And play like Lightnin’ Sam. / But since I blowed my harp / You feelin’ mean and confused. / We got you chained to your earphones / You’re just a white boy lost in the blues.” There is so much in this song. Not the least is that white musicians–particularly in Britain–were in awe of blues kings like Muddy Waters and Lightnin’ Sam Hopkins, but there is so much more than buying a fancy guitar, an amp, and then trying to mimic. 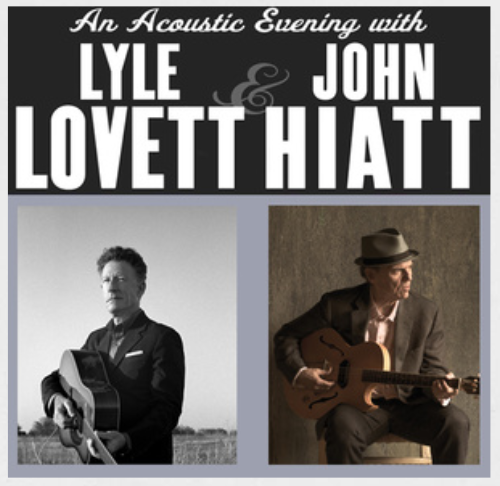 And the reason that Lyle Lovett and John Hiatt can play the song and pull it off is that they are both authentic and keenly aware of their indebtedness to musicians in general, and African-American blues artists in particular, for the music they play. At one point in the show, Lyle talked about seeing John play for the first time in 1981. Lyle didn’t record an album until 5 years later, so he saw John as “a fan.” He specifically referenced, “those of you who are musicians in the audience,” and commented on how special it is for musicians to meet and play with their heroes. I think it was that sense of identification that drew me in–the idea that these guys, who play beautifully, are both Grammy nominees (Lyle’s won a few), and who are heroes–haven’t forgotten what it feels like to be a fan. You could see it in the way they watched and listened to each other, joined in on some songs together, and talked about other musicians. There was genuine humility. It really was one after another. “Fiona,” was a blast, and led to a great story of them playing that song only to have an audience member get their attention during the song by taking out his glass eye and showing it to them. At the time, Lyle wasn’t sure if John had seen this happen, because Hiatt was just “looking straight ahead, playing the song.” But John said he had seen it but knew if he’d looked at Lyle, he would have “fallen off my chair” laughing. It was another instance of being drawn-in. We all know that feeling, and it is most common among friends – those people we communicate with through looks and body language and inside jokes and knowing looks.